THE GOVERNMENT’S LATEST homeless figures show that the crisis is continuing to deepen around the country. The Department of Housing has drawn attention to the fact that the number of homeless families in Dublin has decreased slightly however. 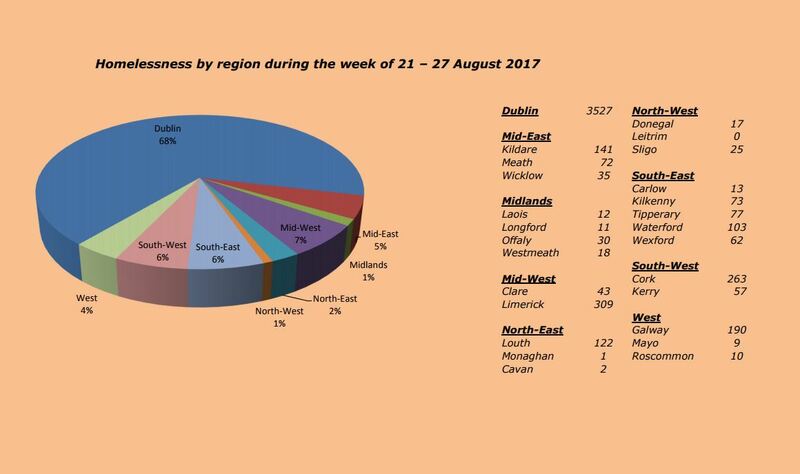 The total number of homeless adults accessing emergency accommodation in the State in August increased to 5,222 from 5,187 in July. The number of children living homeless increased more sharply however from 2,973 to 3,048. Meanwhile, the number of homeless families around the country also jumped slightly from 1,429 in July to 1,442 in August. The government has stressed that the number of families in Dublin (where the worst of the crisis is centred) has actually decreased by 32. “Given that there were 102 additional presentations in Dublin, the overall reduction in the number of homeless families in Dublin is 134,” a spokesperson said. Another way of looking at this, of course is that 102 new families presented as being newly homeless last month, the second highest number in the last four years, and a 42% greater figure than that seen just one year ago. Minister for Housing Eoghan Murphy is currently running a review of its housing strategy Rebuilding Ireland, first launched by former minister Simon Coveney last year. Homeless charities across the country have been less optimistic than the Department of Housing in their reaction to the figures however, pointing to the enormous jump in figures seen year-on-year since 2016. “The increase in the numbers of people experiencing homelessness calls into sharp focus the need for urgent and effective measures to prevent people from losing their homes,” said Pat Doyle, chief executive of the Peter McVerry Trust, in reaction to the figures. Focus Ireland, meanwhile, welcomed the drop in the number of homeless families in Dublin, but pointed out that the position nationally continues to worsen. “The fact that the number of families homeless nationwide has hit a record total shows the nightmare of homelessness is still very much a reality for a rising number of families and children,” the body’s advocacy director Mike Allen said in a statement. The government’s political opposition has also been strident in its condemnation of the latest figures, with Sinn Féin’s housing spokesman Eoin Ó Broin saying that the State has “lost control” of the crisis. “All the government’s summits and plans are not doing anything to help homeless families and children,” he said this morning. Unless the minister is prepared to adapt the measures necessary to keep more families in their homes, such as more protection for tenants in buy-to let properties, then the figures will just keep on rising. Email “Number of homeless children in Ireland passes 3,000 ”. Feedback on “Number of homeless children in Ireland passes 3,000 ”.